For the past few weeks I have been on a vegetarian diet (no meat and fish) to help myself become a healthier and feel better me – I’ve called this my 28 Days Crave Veggies Challenge. As I enter my final (peas-ful) week on a vegetarian diet, I ask the question: Would you go meat-free for a day, week or weekend with me? This meat-free challenge has been a fantastic food experience, where I have seen myself cooking a lot more at home from scratch, being more adventurous with vegetables and flavours to replace the flavours from meat, and have felt less bloated and tired. Hot cross bun with a large mug of tea. Vital Ingredient ‘Create Your Own’ Breakfast Bowl with blueberries, bananas and pomegranate with natural low fat yoghurt and crunchy granola. Wholemeal pitta breads with hummus. Made my very FIRST veggie burger from scratch! 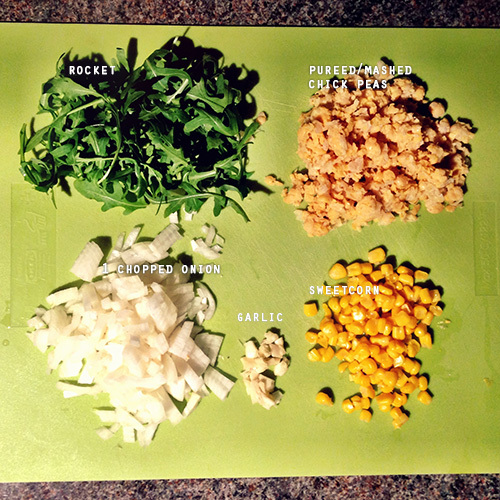 Purée chick peas, pan-fried onions, roasted garlic, sweet corn & rocket mixed with an egg. 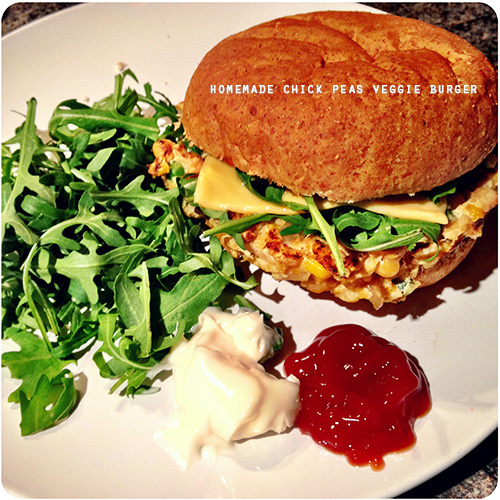 On the bun: MORE fresh rocket, a few slices of tomato, mayo & ketchup! Yum. If you didn’t know, hummus, or ‘puréed chickpeas‘ are are considered one of the most nutritious foods you can eat, all rich in fibre & protein and linked to various health benefits.